Each year, Sita makes a mysterious journey to the Mausoleum, the place of dark memories and warped beginnings. She goes to spy on Emily and Champa, the strange ‘guardians’ she’d run away from and on whom she’d taken a daring revenge. But this year proves to be fatefully different… the terrible, and heartbreaking secrets of the past are starting to emerge. Secrets that inexorably link the three women to each other, to the grey-eyed stranger Kala, and to an altogether different world – the glittering, violent and passionate world of 1940’s Mumbai. Caught in a desperate fight for survival – taboos are broken, forbidden lines crossed. Richly plotted, imbued with fascinating historical detail, and the beauties of place and period. Readers of modern and historical novels alike, including those drawn to British Raj stories, will enjoy this evocative, brilliant and brave novel which is also about the nature of truth. Novels are strange things, as many a writer will tell you, often taking the author into new territories; a helter-skelter ride where the route is uncharted, and the characters unknown. I didn’t set out to write a mystery, a ‘Raj’ novel, or one that switched between different time periods. But once the idea begins to gather pace, like a piece of music, you have to stay with it – and face the challenges, crises and problems that will inevitably arise, like stone boulders blocking your way. For me, writing develops from one piece of work to the other. So there’s never a sense of completion: the future grows rather than narrows, knowledge becomes more complex, demanding and nuanced. This is probably true of all professions. In the writer’s case, the excavation of thought, craft, character and expression has to be deeper, the writer has to drill further – how else is something imaginative, intelligent and dramatic going to be created? Something that’s of us and yet transcends us. Gives us enchantment and wonder, nourishes our soul and intellect; challenges what we believe and know. In writing The Coral Strand I grappled with the contradictions of character, ambition, morality and survival, and have to say, loved the process. As well as the hours spent in the India Office library (now located at the British Library in St. Pancras), where I did much of my research for the 1940s Indian part of the novel. Reading issues of the Illustrated Weekly of India from that period, was like stepping back in time, and provided the rich, social detail which is in the book. Such as the advice about storing stockings in a glass jar that Linda Wiggins gives Emily; MacLean’s advertising its toothpaste as ‘British to the teeth;’ Greens nightclub where Theodore and his Boys are playing and so on. In addition, history books filled out the turbulent, revolutionary and political background, recording events such as the mutiny on the ship Talwar, the trial of the soldiers of the Indian National Army etc. The Coral Strand’s four main characters are women, from different backgrounds and eras, who in way or another, are outsiders, and have to carve out their own existence and survival, inevitably putting them in conflict with others. Truth and secrets, morality and survival became major themes in the novel. After running away from Emily and Champa, Sita decides she wants a moral victory over them, and thus sets in train the consequences which reveal the past, and uncover the last heart-breaking secret. British-Asianism, provides the social setting for the 1990s part of the novel, but informs it, rather than being the story itself. 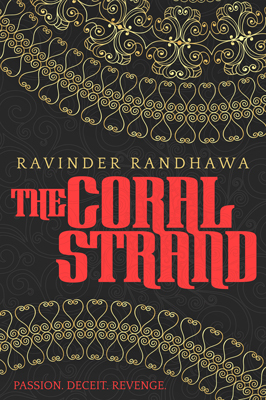 The Coral Strand is very different to much Raj literature. It doesn’t provide a glossy image of sahibs and memsahibs who, whilst representing a ruthless empire, are romantic creatures in exotic settings with soft hearts and tender dreams. The characters, in their different ways, are like gladiators thrown into an implacable and dangerous arena where they have to fight for their lives. Empires are not pretty; they exist to exploit the subjugated country, and do so with force, oppression, and a theology of justification – putative truths that cannot be questioned i.e. ‘we are your father and mother,’ ‘we are superior to you,’ ‘our God is the real God,’ ‘our culture is more advanced,’ etc. Similar claims are being made in contemporary times by groups such as ISIS. Thus, truth becomes a major theme in the novel, and is seen as a moral force. As Sita, endeavours to discover the truth about her past, other truths are uncovered.